Hi everyone, and welcome to the October issue of the Shanville Monthly -- but it's not just welcome from me this time -- it's welcome from me, Mrs Shan, and our brand new arrival, Dante Kukulkan Shan!!! 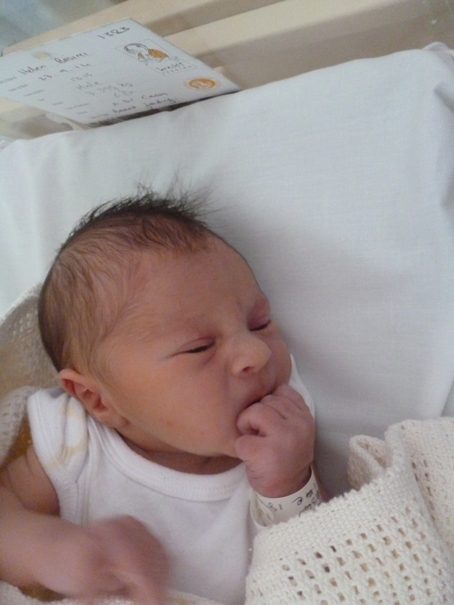 Yep, on September 23rd (the equinox, hence the weird middle name -- Google it to find out more) Mrs Shan gave birth to our first baby, a healthy, hairy boy. We named him Dante, not because we love the poet Dante -- we just liked the name!! He was very nearly called Chaac, after the Mayan rain god, but since Ireland was enjoying its sunniest September in living memory, we felt that Dante was more fitting!! October is a milestone month for me, not just because of the arrival of my son on the home front, but because it also marks the tenth anniversay since the arrival of a very different pair of sons -- yes, it's ten years since the release of Sons Of Destiny, which drew my vampire series to a close! 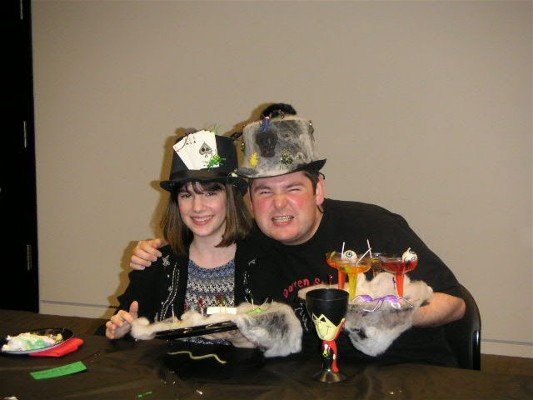 To celebrate the happy occasion, I'm running probably the most exciting competition that I've ever run here on the Shanville Monthly -- I've dug deep into my personal collection of Darren Shan books to produce a series of prizes that will probably never again be repeated!! You can find out all about the competition further down, along with news about the release of Zom-B Family... tour updates... new covers... another competition being run by Bizarre Magazine... and lots, lots more. Enjoy!!! I'm doing a handful of events in October. If you plan to come to any of them, please note there are no limits on the number of my books that I will sign, so feel free to bring your whole collection from home or buy loads of them on the day at the event! 10.30am -- schools/public event, Rose Theatre, Kingston, London. Tickets are free, and open to school groups or individuals. To book, email [email protected] stating the name of your school or group, age of group, number of tickets required, your contact email and phone number. 14/10/14 - this event is now SOLD OUT, but returns might become available if there are cancellations. 9.05am -- schools event, Forest Hill School, Dacres Road, London. 4.00pm -- public signing, Waterstones Bromley, Intu Bromley (formerly The Glades) Shopping centre, Bromley High Street. 11.30am -- schools event, QES Kirkby Lonsdale School, Lancaster. 2.00pm -- public signing, Waterstones Cribbs Causeway, 33 Lower Mall, Cribbs Causeway, Bristol. 1.30pm -- public signing, Plymouth, Waterstones Drake Circus, 1 Charles Street, Plymouth PL1 1EA. 7.00pm -- public event, Exeter. Click here for tickets. 2.00pm -- public event, Limerick. Click here for tickets. Book 9 in the series, Zom-B Family went on sale in the UK and Ireland in late September (you can currently get it for the bargain price of just £5 from Amazon UK and ASDA!!! ), and goes on sale in the USA on October 7th, and Canada on October 14th. It also goes on sale this month in Australia and New Zealand. 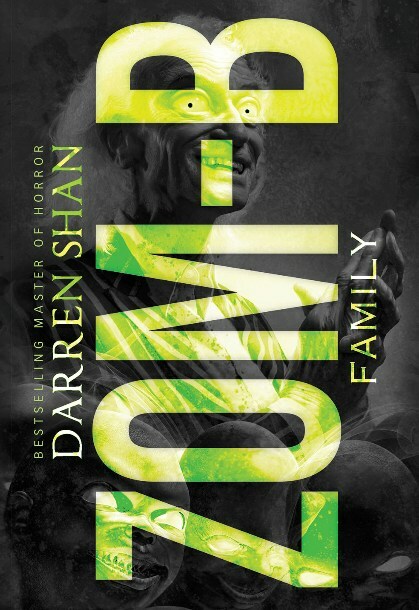 Zom-B Family is one of the most uncomfortable, hardest-hitting books of the series. It's provoked a brilliant, stunned reaction from those who have already read it. For instance, here's a bit of what The Bookbag had to say about it: "Blimey, blimey and blimey again. 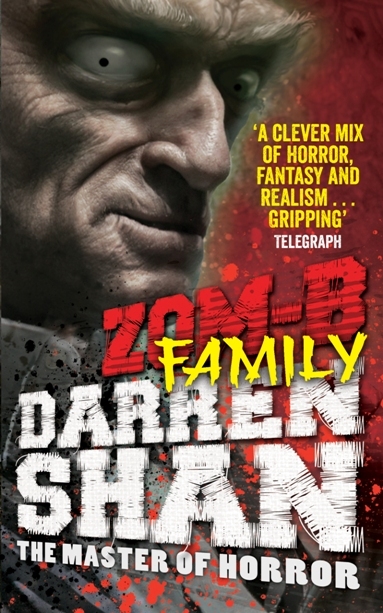 We know that Darren Shan doesn't shy away from violence, blood and guts in his books, but ZOM-B Family really takes the cake for gore. There are fights to the death, torture, maimings and, well, it's carnage, really, from the first to the last page." And here's what a fan called Laura Elizabeth-Howes thought: "Well, Mr. Shan, you've done it again. Another work of pure, soul-destroying genius. Zom-B Family may actually be my favourite young adult book you've written to date. I laughed, cried, smirked, howled with rage, prayed to Lucifer, rubbed my hands together with sadistic glee and I can't wait to ride that emotional roller coaster all over again. I physically can't wait for Zom-B Bride, which I'm sure will be just as sick and twisted as the title suggests." While Lance Lenahan had this to say: "Darren's latest offering to the twelve book series see B in her biggest danger yet and is by far one of the more gruesome of the series. We get to see just how truly deranged and how far that Dan Dan will go to satisfy his twisted desires... The book is nice and fast paced as ever with Darren's writing with excellent plot making this one of the strongest books in the series." UK -- Amazon. UK -- ASDA. UK -- Kindle. UK -- HIVE. Or use 123PriceCheck to compare prices across all major sellers. USA -- Barnes & Noble. USA -- Walmart. USA -- NOOK. CANADA -- Amazon. CANADA -- Kindle. 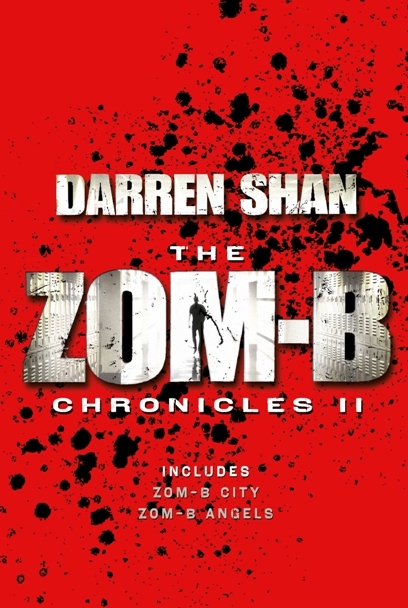 Zom-B Chronicles II, which collects books three and four of the series, goes on sale in the UK and Ireland on October 9th. It should be available in all good book stores, or you can buy it online via Amazon UK by CLICKING HERE. That's the ultra-cool cover above -- neat, huh?!? If you have not yet bought the first volume, you can buy it from Amazon UK by CLICKING HERE. My American publishers released a collected edition of the first three Zom-B books last month, with the second volume hopefully coming soon. You should be able to buy or order Zom-B Chronicles from any good book shop in the USA, but if you prefer, you can order it online through your seller of choice -- I would recommend Barnes & Noble by CLICKING HERE, or Amazon by CLICKING HERE. I’ve only ever sworn once at an event, and it happened to be in one of the Disney complexes in Florida (but that wasn’t why I swore — I like The Mouse!). It wasn’t accidental — it was carefully planned. And it wasn’t for shock value — it was used in very careful context. And even though the room was packed with hundreds of American teachers and librarians, not a one of them tutted or gasped or objected in any way, shape or form — in fact, I got one of the biggest rounds of applause that I’ve ever enjoyed. The answer to the second question is a definite NO!!! "I have just read the speech you gave at the 2010 ALAN Conference in Orlando that is in print in the ALAN Review archives online. I can’t even express fully how JEALOUS! I am of everyone who got to hear you deliver that speech. I have written down many quotes from it that I totally connected to and commend you on such an insightful, inspirational piece. I plan on picking up a copy of your book The Thin Executioner because of what Darci said in her letter to you and how wonderfully you spoke about it throughout the speech. I feel like the literary world and many self-seeking teenagers should be grateful to have such a unique writer like yourself around today. I completely agree with your idea about a teenagers ability to change and that “They’re not the finished article”. As an education major I feel like I can reflect back to your speech for advice when I have students who need the help of constructive criticism if they are writing a piece of their own or feel alone or are in that dark place creatively that you spoke about in your speech. Ultimately, I have to thank you for such an awesome and capturing speech. I only wish I could have been there to experience you deliver it in person." If you want to find out what moved Kayleigh so much, and why I wasn’t run out of town for dropping the f-bomb on Disney, you’ll have to read the talk — having read through it for the first time in years, I think it’s pretty good stuff, even if I do say so myself!!! If you like freebies, and you live in the UK, then this status update from the Zom-B Army is for YOU!!!! If you live in Barnsley and LIKE the status on Facebook, you’ll automatically get a FREE paperback version of Z!!. 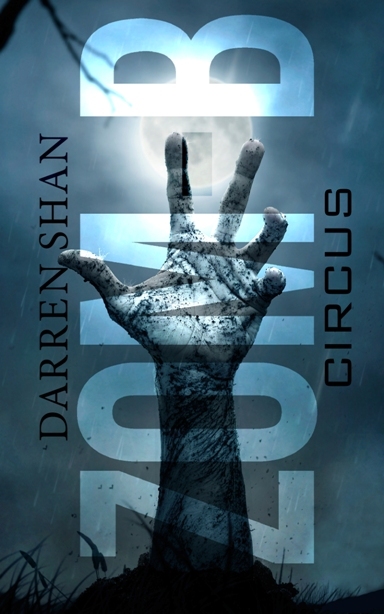 If you live anywhere else in the U.K, you can be in with a chance of receiving a badge, bus pass and book — to do so, simply comment your all time favourite Darren Shan novel along with a quote from that book. Don’t forget to share with your friends, so they can enter too! Participants must be a U.K resident aged 13+ and the competition closes midnight 1st November 2014. These are works that broaden the mind and enrich the soul, books that make life worth living. To remove them from the shelves of schools, libraries and bookstores is to diminish who we are as human beings. It’s not just about standing up for free speech—it’s about standing up for the liberating of the imagination and the shaping of the psyche into something glorious and immense. Books aren’t just worlds we escape into—they’re a way of making sense of the world in which we live, of refining our views of other people and races and religions. When I think of people banning books, I immediately think of the Nazis, Stalin, Pol Pot, ISIS. It stuns me that there are people in America - the self-proclaimed Land Of The Free - who willingly put themselves in the same bracket as Joe Stalin and Adolf Hitler, who seek to suppress free speech, even though it’s written into their Constitution as one of their inalienable rights. Of course this isn’t a problem confined to America. Books face challenges in lots of other countries. If you love reading - or even if you just love that other people love reading - it’s important to stand up and fight for books wherever you live. If we give ground on this front, the enemies of free thought will make progress on all sorts of other fronts. Every book that gets banned - even if it’s just from a single school or library or book shop - is a wedge in the doorway of ignorance, intolerance and rule-by-force. The more that door opens, the more democracy weakens. Good news for my Canadian fans. 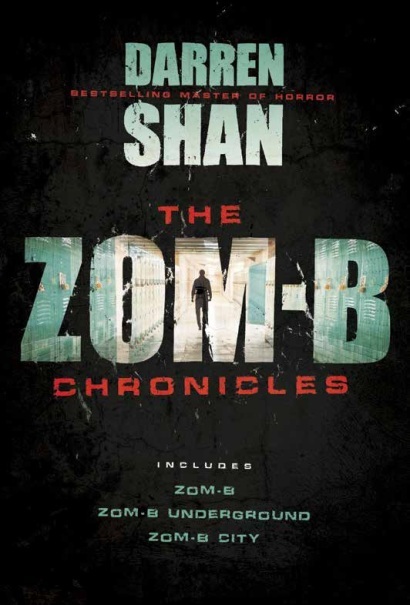 My publishers in Canada, HarperCollins, have released Zom-B Chronicles, the first 3 books of the series, in a low-cost bind-up edition -- it wasn't due to go on sale until October 14th, the same day that Zom-B Family goes on sale, but it's come through a bit quicker than planned, so it's available to buy NOW -- hurrah!!! (Havig said that, it's not yet up on Amazon Canada because of a technical issue, but should be one there soon.) Zom-B Chronicles is on sale in both physical and ebook format, and it's a great way to get started on the series if you haven’t already, and much more economical than buying the individual books! And if you buy it as an eBook, it’s going to be even better value, as they’re including Zom-B Circus, the short additional book I wrote for the series (which I’ve decided to refer to from henceforth as volume 6.5), for free as part of the online package!! If you prefer to buy the physical version of Zom-B Chronicles, don’t worry, as from October 14th you will also be able to buy Zom-B Circus online all by itself as an eBook by CLICKING HERE. Zom-B Circus will be priced at $4.99 but it is currently showing up as being $9.99 on Amazon Canada. This should have changed by the time it becomes available on October 14th, so even if you pre-order it at the higher rate, you should only be charged the lower rate when it downloads on or after the 14th. This October marks the tenth anniversary of the release of Sons Of Destiny in the UK and Ireland, which was the final book, of course, in The Saga Of Darren Shan (AKA Cirque Du Freak in the USA). Hard to believe an entire decade has passed since Darren and Steve faced off under the watchful eye of Desmond Tiny. It was an amazing time for me. The books were selling like hotcakes all around the world... Sons Of Destiny topped the children's paperback bestseller charts for four weeks in a row... I was on tour virtually the entire month... Happy days!! I wanted to post a photo of me from the UK and ireland tour, but I can't currently find any -- social media was a different world back then, and photos of me on tour weren't as common as they are now. However, I did find this picture of me in a rather dashing looking hat from earlier in the year, when I was on tour in the USA -- this pic hails from an event I did in Skokie, on the outskirts of Chicago. When I started Cirque Du Freak in May 1997, I had no idea it was going to be such a long, ambitious series. I liked what I was coming up with, and thought there were legs in the idea -- I hoped to write maybe a handful of books, in which young Darren would encounter various supernatural creatures each time round. Then I started writing book 2 and plotting book 3, and everything began to change as I came up with the idea of the vampaneze and Vampire Mountain and a war between the two factions of the night. 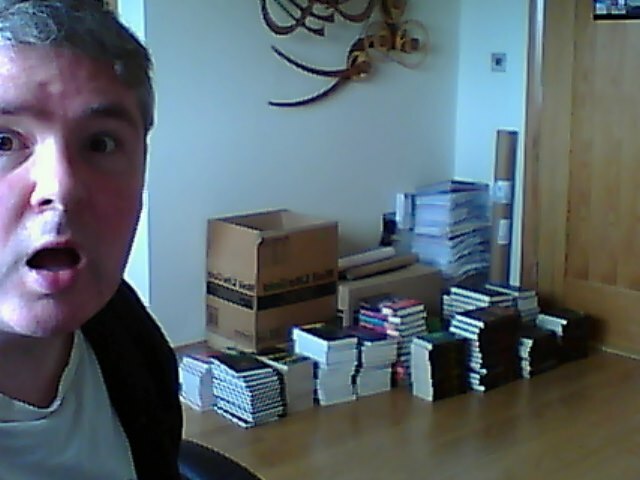 At one point I planned to write upwards of 20 books! The first half would be set in the present, while the second half would move the action into the future (the wasteland that featured in Lake Of Souls). In the end I realised that Darren's story was a coming-of-age tale, and that he had reached adulthood by the time of book 12, and that that was the most natural place to stop. I didn't WANT to stop there - I had no idea if I'd be able to write anything as good or as profitable as The Saga again, and it made no financial sense to end when I had enough ideas to carry on going - but I've always made myself a slave to my stories, and I let them go where they want to go, and finish when they want to finish. I've come a long way in the last ten years... I started and completed The Demonata and The Saga Of Larten Crepsley... I've got three-quarters of the way through Zom-B... there was The Thin Executioner and the five books I've released for adults... I can't be accused of sitting on my laurels!!! But that original series was where everything really started for me, when I went from being on the dole to being a world-successful author, where I stopped dreaming and started living the dream. So even though I don't have a favourite series out of those that I've written, this is the one that means the most to me, as without it, the rest couldn't have followed. So let's all raise a glass of blood to Darren, Mr Crepsley, Vancha, Harkat, Gavner, Evanna, Mr Tiny, Steve, R.V., Debbie, Evra, Kurda, et al, and wish them all a very happy tenth anniversary! Even in death, may they all be triumphant!!!!!! I usually get a few spare copies of each of my books when it is published, and although I've given lots of these away in competitions over the years, I held onto at least one complete spare set from each of the seventeen territories listed above. And now I'm giving those sets away -- including the almost-complete set from Brazil! I will sign each book, of course, making this maybe the only chance you will ever get to own a complete signed set of The Saga Of Darren Shan! You can only enter to win the set from your own country. So, if you live in Hungary, you will be entering to win the Hungarian books. If you live in Taiwan, you will be entering to win the Taiwanese books. And so on. But if you live somewhere else in the world, don't worry, you can still enter, as I'm also throwing in a complete set of American paperbacks of the series, for fans who live in other countries. Make sure you read the guidelines carefully before entering -- and good luck!! 1) a) If you live in any of these countries: Brazil, Canada, Czech Republic, Germany, Hungary, Indonesia, Italy, Japan, Korea, Netherlands, Norway, Sweden, Taiwan, Thailand, Turkey, UK & Ireland, USA. You do not have to answer a question to enter, but you MUST include the name of your country and your own name in the Subject Box when entering. For instance, if your name is Joe Bloggs and you live in Canada, put CANADA JOE BLOGGS in the Subject Box. If your name is Jane Doe and you live in Japan, put JAPAN JANE DOE in the Subject Box. 1) b) If you live anywhere else in the world. You do not have to answer a question to enter, but you MUST include ROW (which is short for Rest Of the Wordl) and your own name in the Subject Box when entering. For instance, if your name is Joe Bloggs and you live in Australia, put ROW JOE BLOGGS in the Subject Box. If your name is Jane Doe and you live in Finland, put FINLAND JANE DOE in the Subject Box. 3) Please INCLUDE YOUR FULL POSTAL ADDRESS in the body of the e-mail. This is so that I can easily send your prize to you if you win. Please also include your age, although this is not mandatory. (4) Closing date is midnight, UK Time, Friday, October 10th, 2014. (8) The draw for the winners will be made on or after Saturday, October 11th, 2014. It will be a completely random draw, made by Darren Shan personally (I use an online number generator to pick the winners). I will try to notify the winners by e-mail, and will post their names on the Shanville Message Board, in the Shanville Monthly, and possibly on Twitter and Facebook too. JIMMY S LEMMON III, USA. GIAN PAULO B BAUTISTA, PHILIPPINES. There were 332 correct and valid entries in total, from all around the world — Australia, Iran, Venezuela, Hungary, Mexico, various European countries, and many more! Thanks to everyone who entered. My congratulations to the winners, and better luck next time to everyone else. I am writing to you because I wanted to tell you the story of my 9 year old son and how your books have changed his life. When Ilyas was 7 he was diagnosed with ADHD. 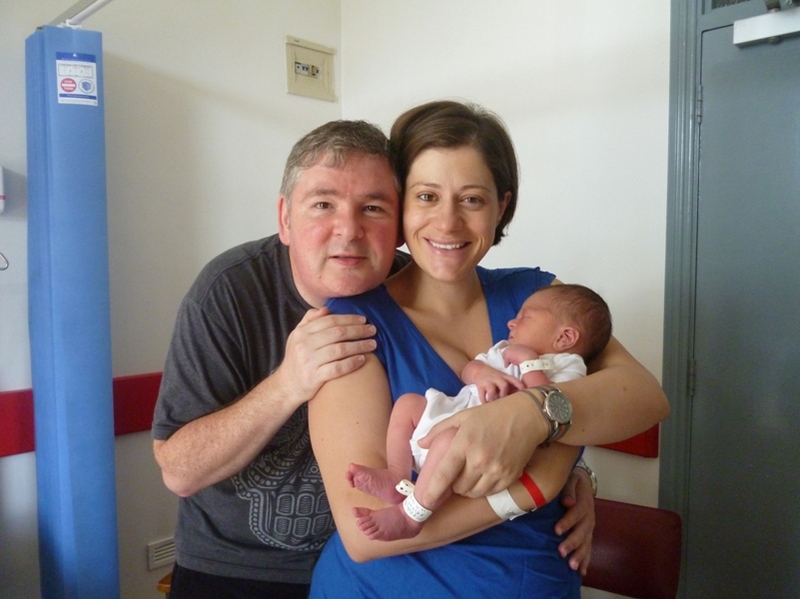 His teachers and I had known there was something up since he started school but still the diagnosis was incredibly difficult for us. He has had such a tough time of it, feeling different from his peers and out of control of himself. He has always loved stories, and being read to, by me and with audio books but never had the ability to concentrate on anything longer than a child’s picture book. He would pick up books and put them down, overwhelmed by the small fonts, the long words, the simple size of the books themselves. I could see his frustration and do nothing to help. Then, this summer, all that changed. We picked up Cirque du freak and brought it with us on holiday. I read a couple of pages to him and then he was so desperate to know what happened that he picked up the book and read it all himself. In two days. So we downloaded Vampire’s assistant and he read that too. And then he read the entire series within the space of a month! This child who had never read anything more complicated than a Horrid Henry book, and that took him weeks, was suddenly reading for an hour at a time and begging to stay up late for just one more chapter. I still can’t believe it. He has just finished book 4 of the Larpsen Crepsley series and has started the Demonata series. I just wanted to say thank you for your stories. Thank you on behalf of my little boy who has had, for the first time, the joy of being so lost in a story that he doesn’t even come up to breath. Thank you for giving him that pleasure. Thank you for giving him something to boast about at school - how he read FIFTEEN books this summer and they were HORROR. And most of all thank you for showing him that despite his ADHD he CAN learn and concentrate and do what other people can do. I received two polar opposite responses on Twitter recently, after posting A link to the Amazon UK £5 Zom-B Family offer, and I think they neatly sum up the horns of a dilemma on which all writers are currently pronged. Angel Falls: I’d rather get mine from Waterstones, I don’t have problem paying full price and I’d rather keep the book shops open! I love book shops, and I always try to encourage fans to support their local booksellers. But at the same time I also love the ease of being able to buy a book online that I want or that someone has recommended, and have it quickly delivered to my home. And don’t get me started on eBooks—I do most of my reading on a Kindle these days, and I still think being able to download a book in seconds is magic of the highest, coolest order! But regardless of where I stand in the struggle between the online sellers and the high street stores as a reader, as a writer I’m always and forever on the side of my fans, and I feel that my first obligation is to them above all others. So, when a great online deal comes along, I feel it’s my duty to make my followers aware of it. As a writer, it’s not about supporting the independents or selling my soul to the multinationals—it’s about providing you guys with all the buying information that I can, so that you can make an informed decision and purchase. So I will continue to provide links to Amazon, Waterstones, B&N, Walmart or whoever, since I think it’s only right and proper that my fans know where the best bargains can be found. If they choose to ignore those bargains, in order to support their local bookseller and help keep them open—great! I’ve a lot of respect for people who care so deeply about books, they’re fighting a good fight, and I hope it’s one they win. But if people prefer the convenience and bargains of online shopping… well, that’s simply a reality of life in the 21st century. As a reader, I mourn the loss of our high street stores whenever one closes, but as a writer I’ve got to move with the times or risk becoming a dinosaur. Readers can choose sides if they wish, but writers shouldn’t, because in the end we’re just providing a service, and YOU readers are the customers, and as the old saying goes… the customer is always right!!!! In line with all the above, this feels like a good time to remind people that you don’t need an eReader to read an eBook. Yes, it’s something I only found out a few months ago, and even though it’s no secret, a lot of people still aren’t aware of it—I receive a lot of comments about Zom-B Circus and The Evil And The Pure, which are only available in eFormat, from fans saying they can’t buy and read them because they don’t have Kindle or Nook or whatever. But most of the online sellers provide Apps that allow you to purchase and read eBooks through your PC, Mac, smartphone, or any other device with internet access. The Real Books vs eBooks argument will rage on and on for many years, I imagine, but the one huge advantage that eBooks have is that in the digital world, there are virtually no borders to speak of. The big companies are all pushing their own reading devices, but in truth anyone who can get online can download and read eBooks, using whatever device they prefer. 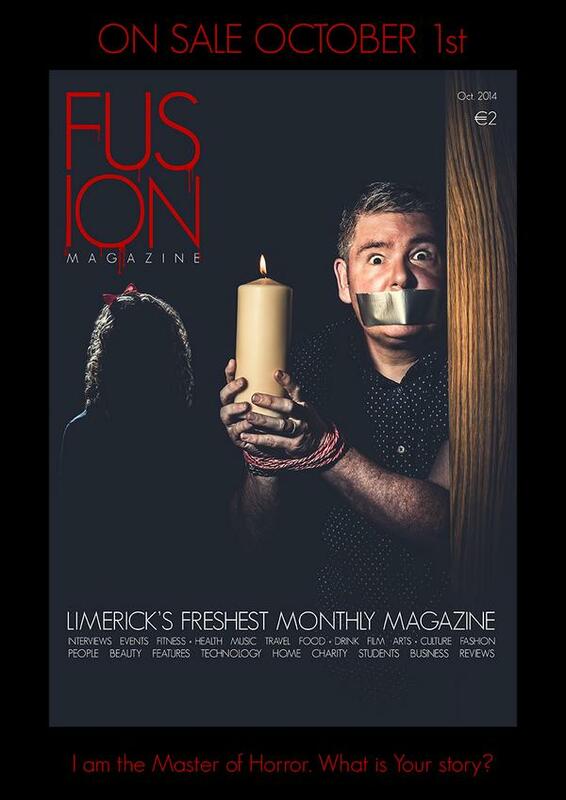 You can't put a gag on Darren Shan!!! Oh... wait... yes you can!!! I've got to be honest -- I hate being photgraphed. I don't mind the snaps that I take with fans at events -- they're always good fun. I mean being professionally photographed. It just doesn't agree with me, especially when I get a fussy photographer who wants to spend hours trying to get the "perfect" shot -- only to come up with something that looks no different to a snap I could have taken myself. The manga edition of Allies of the Night goes on sale in Finland on October 1st. The first 7 volumes are already available in Finnish, with the rest soon to follow. Enjoy!!! Now, I know that's not the sort of image you usually find in the Shanville Monthly, but there's a great and fun competition currently being run by Bizarre Magazine, with five sets of ALL NINE of the books in my Zom-B series that have so far been published up for grabs!!!! And the best news of all is that it's open to fans everywhere in the world!! What are you waiting for -- click on THIS LINK through to their Facebook page and enter NOW -- but you'll need to be quick, as entry closes on October 3rd!!!!! Best of luck to you all! !